“If you think there are cones out there now, they’re not going away anytime soon. 2016 is going to be a whole lot of dirt moving. We’re moving fast and furious for 2017 and beyond,” she says. Movie titles and sports metaphors are used frequently by local leaders to express their excitement. Corporations, chefs and Class A office projects are transforming Cobb County from a bedroom community into a more prominent player in Metro Atlanta’s sporting and economic scene. Plans for the $672-million, 41,500-seat Braves stadium led to a flurry of announcements and construction starts in 2015, including Cobb’s first Class A office buildings in more than a decade. In addition, some of Atlanta’s top chefs, such as Ford Fry and Linton Hopkins, and regional office headquarters, such as Comcast’s, plan to locate in The Battery Atlanta, the mixed-use development next to the stadium. “The Battery Atlanta and SunTrust Park will be the new heart and soul of Cumberland. Nothing will bring more activity, energy, community and brand identity,” says Mason Zimmerman, senior vice president for Pope & Land Enterprises, a member of the development team. The $400-million Battery Atlanta project includes 630,000 square feet of Class A space, 500,000 square feet of retail (more than 40 boutiques and restaurants), a 16-story Omni Hotel and 530 residential units. Although Zimmerman has been actively involved with the Braves and the mixed-use project for more than 18 months, he said he is amazed by the ripple effect the project has had on Cobb and the entire I-75 corridor. “It has been overwhelmingly positive so far, and we are still more than a year away from first pitch,” he says. The Braves aren’t the only pro sports team heading OTP (outside the Perimeter). Atlanta United, the new soccer club, announced in November the construction of its headquarters and practice facility in the Franklin Road Corridor of Cobb. That 32-acre project represents more than $50 million in new investment and is expected to create 80 jobs by 2017. Connell is also quick to remind folks of another win for Cobb. “I should point out that in 2015, Georgia’s first professional lacrosse team chose Cobb County as their home.” The Atlanta Blaze will play at Kennesaw State University’s Fifth Third Bank Stadium beginning later this year. “We have created a lot of positive momentum in the past few years by doing the right things the right way, and this new project is just another example of that momentum,” he says. The creation of more Class A office space is one of the hallmarks of the construction boom in Cobb County. Three more projects, in addition to The Battery Atlanta, will add a combined 1.25 million square feet of new high-end office space to the Cumberland-Galleria market. “It was essential because we have not had any Class A offices built in over a decade. We had the project activity, but we had to have [somewhere] to place the jobs,” says Brooks Mathis, senior vice president of economic development for the Cobb Chamber of Commerce. Synovus expects to bring 300 employees to 1100 Overton, a mixed-use, 200,000-square-foot development by TPA Group. Encore Center, by Greenstone Properties, is another 200,000-square-foot Class A building at I-75 and Cumberland Boulevard. Highwood Properties is building Riverwood 200, a Class A office building with 299,000 square feet and lead tenants such as Bennett Thrasher, a full-service CPA firm, and Delta Community Credit Union. When an independent group polled Bennett Thrasher’s associates, close to 85 percent said they wanted to stay in the Cumberland-Galleria market, which was amazing, says Kenneth Thrasher, the firm’s chairman and a founding partner. The firm is currently located just a quarter-mile away from its future digs. The new offices in Riverwood 200 will enable the company to expand from 240 staffers to 300 by 2018, he says. The Riverwood complex is in the Cumberland CID, which has $3.5 billion in public and private investment coming between 2013 and 2018, including major infrastructure and roadway projects. The CID has more than 10 capital improvement projects underway, and the organization expects that number to double in 2016. “Even though we all knew that we were poised for growth, that growth has really accelerated because of all the activity, most highlighted with what the Braves are doing with their ballpark and development,” Rivers says. Elsewhere, the 2015 closing of a $10-million redevelopment bond in South Cobb will help jump-start economic growth in the Six Flags area, says Cobb Commission Chair Tim Lee. The Home Depot, already a heavy hitter in Cobb as one of its five Fortune 500 companies, recently opened a 200,000-square-foot technology center off Franklin and Delk roads in Marietta. In summer 2015, it moved 1,000 associates from its Vinings headquarters to the new campus setting with plans to hire another 500 workers for the center. Tax incentives offered by the county landed The Home Depot name and jobs to an area in the midst of revitalization, funded by a $68million Marietta Redevelopment Bond initiative approved in 2013 by residents. Marietta Mayor Steve Tumlin says the Franklin Road Corridor transformation is already exceeding expectations. The city has bought four apartment complexes, some of which were high-crime properties, and plans to demolish them to attract business development in the 60-acre area. The Franklin Road Corridor is within the Gateway Marietta CID, which is one of the newest and smallest CIDs with a $200,000 annual operating budget. Founded in June 2014, the CID is seeking to help transform the area from one of struggling business parks into a premier business center. Projects in 2015 include developing a landscaping plan for the Delk Road and South Loop I-75 exits, which are the CID’s north and south boundaries, to improve the entrance into Marietta. Folks driving to areas such as the Marietta Square, where Theatre in the Square launched its comeback in November 2015, now think “get me there as quick as I can from the interstate,” Barry says. Tumlin is seeing younger people moving from in-town neighborhoods and buying homes in the $300,000s to $600,000 around the historic area. For those who can’t walk or bike to their jobs, sitting in traffic to just reach I-75 from Cobb homes can be time-consuming and frustrating, before even hitting gridlock on the interstate. The county needs to make sure it has adequate transportation, says Michael Hughes, director of Cobb County’s Office of Economic Development. As part of its 2012 four-year Special Purpose Local Option Sales Tax (SPLOST), more than 80 projects are in construction or pre-construction stages in the county. Between 2012 and 2014, the county made available for bid more than $175 million in projects, according to the Cobb County Department of Transportation. Rebranding efforts extend to transportation and infrastructure, with the renaming of Cobb County International Airport-McCollum Field (with international flights, a customs inspection station and a new air traffic control tower) and rebranding of Cobb’s transit system as Cobb LINC, which plans to add the Cumberland Circulator shuttle to move folks around the SunTrust Park area. The system, in operation for 25 years, delivers 3.5 million trips annually. A diverging diamond interchange at Windy Hill Road and I-75 – one of a number of projects in this corridor – is expected to open by early 2017. Along I-75 and I-575, 30 miles of managed lanes – toll lanes with limited access points – are expected to open in 2018. The managed lanes project will meet a lot of the demand that businesses and industry need to grow, Mathis says. By June 2016, a $21-million U.S. 41 widening project from Paces Ferry Road to Akers Mill Road should be complete. In spring 2016, the Skip Spann Connector will open north of the Chastain Road exit on I-75 to connect the Town Center area with Kennesaw State University. The project is expected to reduce congestion on Chastain Road by 19 percent and will include bike-pedestrian facilities in an effort to meet the needs of Kennesaw State University (KSU) students. KSU – the state’s third largest public institution, with 33,000 students following its merger last year with Southern Polytechnic State University in Marietta – has nearly a $1.2 billion economic impact, according to research by the Carl Vinson Institute of Government at the University of Georgia. To help KSU deploy its resources to drive economic development, it brought on its first-ever vice president for economic development and community engagement, Charles Ross, formerly with the Enterprise Innovation Institute at Georgia Tech. KSU also created a new Georgia Business Success Center, a business accelerator and incubator, in partnership with the Cobb Chamber’s Competitive EDGE program. It’s just one of the reasons KSU was ranked as one of the nation’s “Most Innovative Schools” in U.S. News and World Report’s 2016 Best Colleges issue. In 2015, the nearly $40-million Dr. Betty L. Siegel Student Recreation and Activities Center opened, and the school’s first football team began playing at the 8,300-seat Fifth Third Bank Stadium, which Major League Lacrosse’s Atlanta Blaze will also call home in spring 2016. KSU’s recently announced National Institutes of Health grant – a five-year $1-million award – will help biomedical research programs increase the number of doctorate-holding scientists from underrepresented groups. Other new programs at KSU include a Ph.D. in analytics and data science and a master’s of science in healthcare management and informatics, which Papp says is a much-needed program in the health industry. From the top of Kennesaw Mountain National Battlefield Park, a popular place for hikers and folks with pets, you can look out one side and see a cluster of WellStar Health System facilities in Marietta. WellStar, which Tumlin describes as a tremendous economic engine, is trying to grow its prominence. In 2015, WellStar opened an inpatient pediatric unit at WellStar Kennestone Hospital and an outpatient surgery center at WellStar East Cobb Health Park. This year, it plans to open a major renovation of the Cancer Center at WellStar Kennestone Hospital. As part of that scale-up, WellStar’s board approved the purchase of Tenet Healthcare’s five metro-area hospitals in late 2015. In addition, WellStar will acquire West Georgia Health in LaGrange early this year. 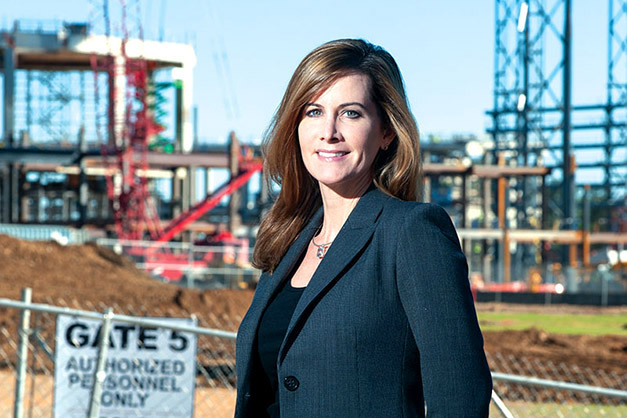 In February, WellStar plans to break ground on its third health park in Vinings and is exploring possible facilities near SunTrust Park, Saunders says. All of this activity is just one more part of the area’s focus on projects designed to enhance the quality of life for Cobb – and metro – residents. Live-work-play now is a greater possibility in areas from Cumberland to Kennesaw. Dreams of a nightlife aren’t confined to the Cumberland area. In Kennesaw, Mayor Mark Mathews has been dreaming of a Main Street revival for 15 years. Years of negotiating with property owners and planning to bring traditional downtown development to the city have paid off with the Revival on Main project, which is adding 250 apartments and 11,000 square feet of commercial and retail space that is fully leased. “We are going to have people living downtown, have a downtown with a heartbeat at night,” he says. Revival on Main is sparking investment by other business and property owners around the city center, Mathews says. In a warehouse near downtown Kennesaw, people whisk in and out of Farmers Market Baskets, a produce co-op, picking up baskets pre-packed with lettuce, apples, yellow onions, potatoes and other fresh produce. Kristina Plauche began the business seven years ago to provide fresh food to folks who wanted to eat healthy and affordably. She took courses and received free confidential advising at the Small Business Development Center at Kennesaw State University. Retail, restaurants, grocery stores and other amenities are following rooftops around the county. The 300,000-square-foot Kennesaw Marketplace by Fuqua Development is expected to open in summer 2016 with Academy Sports and Whole Foods Market. Kroger plans to open in Cumberland Mall, after the county approved a rezoning request to locate on the top floor where Sears currently is located (Sears will remain on the lower level), says Michael Hughes, director of Cobb County’s Office of Economic Development. In the Cumberland-Galleria area alone, 5,500 new housing units could bring nearly 11,000 new residents, says Malaika Rivers, executive director of the Cumberland CID.